The Himalayas, the world's highest mountain range, seen from space. A mountain range or mountain belt is a geographic area containing numerous geologically related mountains. A mountain system or system of mountain ranges, sometimes is used to combine several geological features that are geographically (regionally) related. Most geologically young mountain ranges on the Earth's land surface are associated with either in the Pacific Ring of Fire or the Alpide Belt. The Pacific Ring of Fire includes the Andes of South America, extends through the North American Cordillera along the Pacific Coast, the Aleutian Range, on through Kamchatka, Japan, Taiwan, the Philippines, Papua New Guinea, to New Zealand. 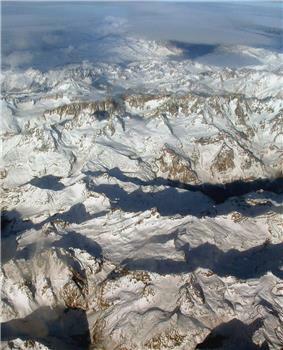 The Andes is 7,000 kilometres (4,350 mi) long and is often considered the world's longest mountain system. The Alpide belt includes Indonesia and southeast Asia, through the Himalaya, and ends in the Alps, Spain and Atlas Mountains. The belt also includes other European and Asian mountain ranges. The Himalayas contain the highest mountains in the world, including Mount Everest, at 8,848 metres (29,029 ft) of elevation. 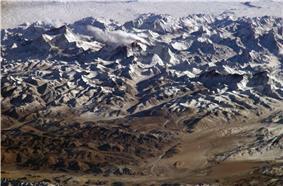 Mountain ranges outside of these two systems include the Arctic Cordillera, the world's northernmost mountain system. If the definition of a mountain range is stretched to include underwater mountains, then the Ocean Ridges form the longest continuous mountain system on Earth, with a length of 65,000 kilometres (40,400 mi). The mountain systems of the earth are characterized by a tree structure, that is, many mountain ranges have sub-ranges within them. It can be thought of as a parent-child relationship. For example, the Appalachian Mountains range is the parent of other ranges it comprises, some of which are the White Mountains and the Blue Ridge Mountains. The White Mountains are a child of the Appalachians, and there are also children of the Whites, including the Sandwich Range and the Presidential Range. Further, the Presidential Range can be broken up into the Northern Presidential Range and Southern Presidential Range. Mountain ranges are constantly subjected to erosional forces which work to tear them down. Erosion is at work while the mountains are being uplifted and long after until the mountains are reduced to low hills and plains. The rugged topography of a mountain range is the product of erosion. The basins adjacent to an eroding mountain range are filled with sediments which are buried and turned into sedimentary rock. The early Cenozoic uplift of the Rocky Mountains of Colorado provide an example. As the uplift was occurring some 10,000 feet (3,000 m) of mostly Mesozoic sedimentary strata were removed by erosion over the core of the mountain range and spread as sand and clays across the Great Plains to the east. This mass of rock was removed as the range was actively undergoing uplift. The removal of such a mass from the core of the range most likely caused further uplift as the region adjusted isostatically in response to the removed weight.